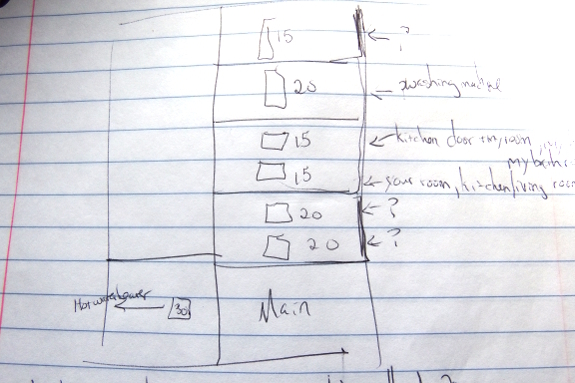 Figuring out our breaker box became a lot more intuitive once our electricity was turned on. At that point, we were able to use the tried-and-true technique of turning on all the lights in the house then flicking breakers one by one to see when each zone went dark. In the process, I learned that I'd incorrectly added up the amperage already in use in our box. First of all, there were three wired but apparently unused breakers in operation. I'm a little leery of simply deleting them, but I'm equally leery of leaving juice running to wires that seem to go nowhere. At the moment, I'm leaning toward pulling those mystery breakers and associated wires out and using the spots for something else. 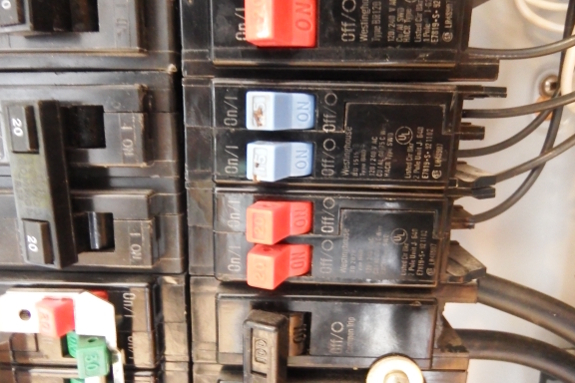 I also learned that the two breakers shown in the center of the photo above are what's known as tandem (or cheater) breakers. Each one allows the wiring of two unrelated circuits in a single spot. Despite the name, they're not necessarily cheating...although they can be. Tandem breakers can also be a problem because they're small and heat up easily, so they have a tendency to flip a lot. Sure enough, Mark's breaker flicks every time he turns his space heater and his big monitor on at the same time. Assuming those confusing slots mentioned above really aren't in use, it seems like a good idea to ditch the "cheaters" and wire each of our zones onto a standalone circuit that will be less likely to overheat. I have an 1903 house. Big conductors going out the breaker box. 14 gauge [15 amp] at the end. Oh well. Glad you are finally getting juice. Keep your connections tight. And fix any flickering circuits. New wire is cheap. I did all my new stuff with 12 gauge even for lights.